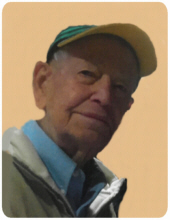 Lewis F. “Louie” Kramer, 86, of Middletown, passed away Wednesday, January 30, 2019, at Atrium Medical Center. He was born in Middletown on January 18, 1933 to parents William Jasper and Laura Belle (Brewer) Kramer. Louie worked as a welder with S & K Construction for 25 years and was a member of Carpenters Union Local 113. He was a meticulous builder, took great joy in helping others and had a great sense of humor. He also loved cars. Mr. Kramer is survived by his wife, Loretta (Fultz) Kramer; daughters, Lynn (Darrell) Taylor & Luann (Todd) Tadych; grandchildren, Lauren (Jeremy) Turley, Chelsea (Alex) Napier & Zachary Taylor; and great grandson, Roscoe Napier. He was preceded in death by his parents and brother, Ted Kramer. The family wishes to extend special thanks to Dr. Jennewine & his nurse Rema, for all their care through the years. A Gathering of Family & Friends will be held Sunday, February 3, 2019 from 2:00 – 4:00 pm at Wilson-Schramm-Spaulding Funeral Home, 3805 Roosevelt Blvd., Middletown. Memorial donations may be made to Spring Hills Assisted Living, 3851 Towne Blvd., Middletown, Ohio 45005 – OR - Alzheimer's Association/Greater Cincinnati Chapter, 644 Linn St.,Suite 1026, Cincinnati, Ohio 45203. To send flowers or a remembrance gift to the family of Lewis F. Kramer, please visit our Tribute Store. "Email Address" would like to share the life celebration of Lewis F. Kramer. Click on the "link" to go to share a favorite memory or leave a condolence message for the family.